Cebu, the Queen City of Southern Philippines, is located at the very heart of the country. Cebu is famous for their mouthwatering ripe mangoes, great beaches, islands, diving, snorkeling, etc. It is one of the most popular tourist spots in the Philippines, right up there with Boracay, Davao and Bohol! #1 - Tepanee Beach Resort (Malapascua, Logon): Are you and your loved ones looking for great rest and relaxation via renting out super clean rooms, with a quiet air conditioning, WiFi, a lovely balcony, etc. -- on top of excellent customer service, no less than from the amiable owners themselves, with their attentive staff? Do you want to enjoy sun lounging, diving, snorkeling, swimming, kayaking and other ultra fun beach activities? What is more, have a blast with their amazing Italian cuisine, refreshing drinks as well as a stunning, fiery sunset by the beach! Don't you hesitate now and be wowed by a summer escape through Tepanee Beach Resort! #2 - Ocean Vida Beach & Dive Resort (Bounty Beach:) There has got to be so much you'll love about Malapascua Island's Ocean Vida Beach & Dive Resort! They may have basic rooms, with air conditioning, a mini bar, towels, and a balcony that's facing either the stunning ocean or a refreshing garden; yet you'll be amazed at their superb staff service, restaurant, bar, bean bags by the beach which will offer you a breathtaking view of the sunset. To top it off, be greeted by the friendly mutts that hang around the ground floor area -- for all you dog-lovers out there and also experience how it is to go diving with your loved ones plus even swim with thresher sharks together underwater! #3 - Ravenala Beach Bungalows (White Beach, Moalboal): Turn your life's darkness into light, enjoy, that's right! Over at Ravenala Beach Bungalows -- which has 9 available bungalow rooms for you and your fambam to enjoy a vacay at their wonderful beach. Just be extremely happy as you discover their numerous dive sites that include a marine sanctuary, an airplane wreck, Panagsama Reef, to name a few. If you are looking for massage, golf and snorkeling -- this is surely the place for you too! Moreover, this spectacular resort also provides excursions so you can explore Cebu Island more -- visit Carcar& Argao, Kawasan Waterfalls, Lambug Beach, Negros Island, and many others! #4 - Malapascua Exotic Island Dive & Beach Resort (Bounty Beach): Experience Malapascua Exotic Dive & Beach Resort's loving by providing you and your company probably the best diving experience you can ever have! Along with that, for the adult adventurers out there, you can revel in their day trip to Calanggaman Island, on top of their diving trips to pristine Camotes Island, Maripipi Island, and their expert divers can even take you on a tour to see thresher sharks in Monad Shoal! But wait there's more! They have a great beachfront too, with white sand and crystal clear blue water, excellent for families, buddies and lovers who are craving for laughter together amidst an ecstatic swimming time. 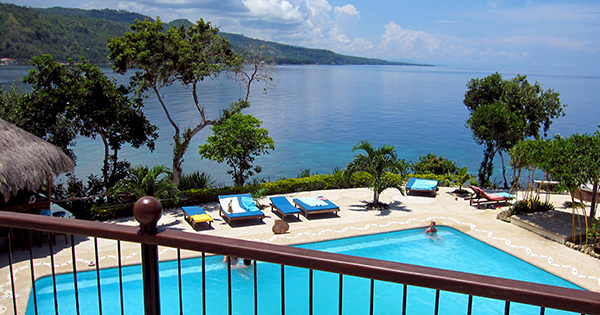 #5 - Granada Beach Resort (Oslob): What an outstanding beach this is, nothing compares to Granada Beach Resort! It's like heaven coming down on earth with their amazing house reef at their private beach, where guests can snorkel to their heart's contentment. First time snorkelers need not fret for they provide free gears for this uber enjoyable water activity! Bask in their impeccable customer service too, in addition to being gastronomically satisfied by their local plus international cuisine. On top of that, have that super comfort in staying either in their ocean view room or pool view room, complete with modern amenities -- the price can go as low as only $57/night, for their twin room with ocean view - good for you, and a friend or two!